Samuel grew up in Queens New York, being the oldest of three sons of Russian immigrant parents. He was attending City College New York night school, and working as an insurance agent & accountant when he was drafted in March of 1942. After basic training he was assigned to the 305th Infantry Regiment, 77th Infantry Division., at Ft. Jackson in South Carolina. Applying to OCS (Officer Candidate School), he was accepted into class 112 at Fort Benning, Georgia, graduating as a 2nd Lieutenant on 27th of November 1942. The first assignment for him was as a 2nd Lt. with the 1st Battalion, 354 Infantry Regiment, 89th Infantry Division at Ft. Carson, Colorado. In May of 1943 he was promoted to 1st. Lt., and made the S-4 (Supply and Logistics) for the 1st Battalion of the 89th Infantry Division. While in that position, 1st Lt. Weinstein requested assignment to a combat unit overseas, and on the 11th of August 1944, he shipped out to the ETO (European Theater of Operations) as a replacement officer, arriving at Omaha Beach on the 25th of August, 1944. On September 16th 1944, he was made the platoon leader for the 1st Platoon, Company C of the 60th Infantry Regiment in the 9th Infantry Division. It did not take long for Samuel to get right into the action. A few days earlier, on the 14th of September, the 60th Infantry Regiment had been on line outside of the Hurtgen Forest since the 12th of September 1944. They had been in sporadic but continuous action prior to moving into the Monschau Corridor, and became sitting ducks for the many German soldiers entrenched in pillboxes defending the Alzen-Hofen Ridge and alongside the Corridor. On the 16th of September 1944, progression up the ridge was stalled by all units due to the overwhelming firepower and location of the German’s. The Regimental Companies fighting in this area had been seesawing back and forth for the town and objective of Alzen from the 14th of September. Samuel Weinstein and his men joined these battles for the Alzen-Hofen ridge area on September 18th. Difficult to maintain possession of the town the fights moved back and forth, and it took several Companies to take the town once more. By 1400 hours on the 18th of September, the men of the 60th Regiment had secured their objective and captured Alzen. The next day they were moving toward the village of Monschau where they mounted trucks for a motor march to the Zweifall vicinity in and around the the Hurtgen Forest area. On the 20th of September, in a driving rain, they were in a foot battle that begun at 1300 hours. Due to the extremely bad weather, units became lost and disorganized and eventually had to retract their steps back to the original line of departure. 1st Platoon of C Company, 60th Infantry Regiment was sent south toward Schalts on the West of the battalion zone of action. 1st Lt. Weinstein’s Platoon reached the objective with little difficulty, but the other Platoons as well as units from B Company met heavy resistance. Under heavy enemy attack it was determined that the enemy force facing the company was to large for them to hold their position and additional units from the 3rd Battalion, 60th Infantry Regiment were ordered to assist. For the next two days the enemy continued to attack and shell the Regimental positions. It was during this shelling that 1st. Lt. Weinstein was wounded by shrapnel on 26 September and evacuated to a field hospital. After spending 3 months recuperating, Lt Weinstein was reassigned back to the 60th Infantry Regiment as a platoon leader with A Company on 26th of December. He was thrown right into the Battle of the Bulge. Little is known about his activities during this period. We do know that Lt. Weinstein was again evacuated wounded with frozen feet while his unit was manning an outpost near the village of Kaltherberg in Germany. Also sometime during one of his two short tours into combat with the 60th Infantry Regiment he was, for a short time, taken prisoner. There were a number of instances during these periods that members of the 60th Infantry Regiment had captured pillboxes and then the enemy would take them back along with the men manning them. Only to have the 60th Infantry Regiment retake the pillboxes and rescue those taken prisoner. 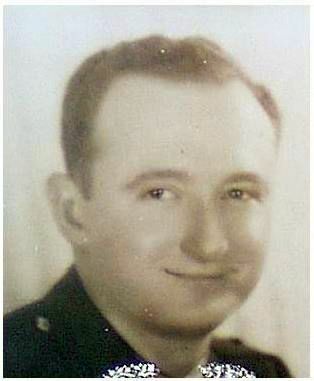 Lt. Weinstein was evacuated back to the United States on April 1st, 1945, officially discharged on the 24th of October in 1946, and assigned to the 156th Organized Reserve Infantry Group in Queens New York. He was promoted to Captain on the 14th of March 1946. He held various assignments with the Organized Reserve until his discharge from the Army of the United States on October 26th, 1951. 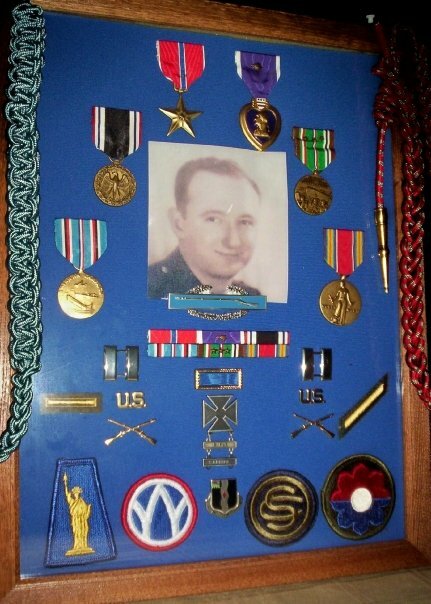 Captain Samuel Weinstein’s decorations and patches of the various units he served in. For his service, Captain Weinstein received the Combat Infantry Badge, Bronze Star Medal, Purple Heart Medal with bronze oak leaf, Prisoner of War Medal, WWII American Campaign Medal, ETO Theater Medal with 3 bronze stars and the World War II Victory Medal. As a member of the 9th Infantry Division, he received the Presidential Unit Citation ribbon, & the Belgian Fourragere. The actions of Captain Samuel Weinstein will never be forgotten.